Bingo Enchanted launched February 2016. The most magical site on the Virtue Fusion Network, join today and discover their range of sparkling bingo rooms for you to enjoy. You’ll find 75, 80 and 90 ball variants as well as super speedy bingo and popular favourites Rainbow Riches, Deal or No Deal and Who Wants to Be A Millionaire! Plus, their exclusive mini-network multi-variant room Bingo Bliss is especially reserved for Enchanters and sister sites, so you have even more chances to win! They’ve also got a variety of spell-binding slots and scratchcards such as Clover Rollover, Snow Queen’s Magic and Lucky Ladies which often have jackpots in excess of £2million! 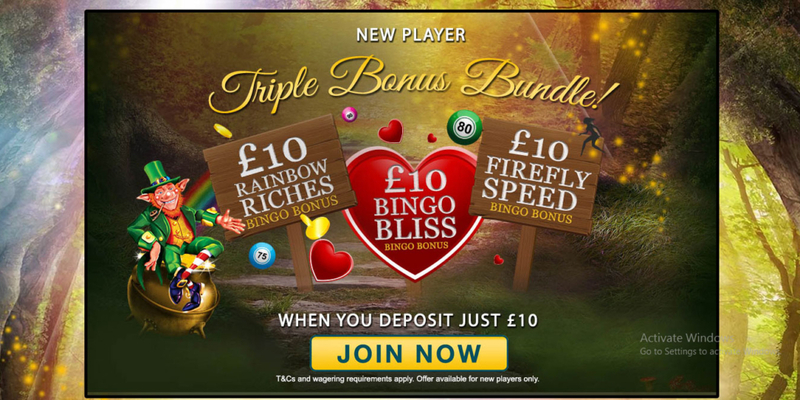 Venture into Bingo Enchanted for what they claim to be the most magical new player offer out there. That’s a 300% bonus. You’ll automatically get £10 Bingo Bliss bonus so you can play in their exclusive Bingo Bliss room, £10 Rainbow Riches Bingo bonus to help you find that pot of gold at the end of the rainbow PLUS £10 Firefly Speed Bingo bonus so you can sit back and watch the balls get called at a quicker rate – you could be a winner before you know it. Winnings from bingo bonus spending will go to the bonus balance until the wagering requirements have been met in full. With amazing daily offers and weekly promotions, you won’t want to leave this magical kingdom! Cashback Wednesday – get a different cashback code every week, with up to 100% cashback on slots or bingo! Friday Fiesta – Enjoy a little afternoon delight with 2 hours of quizzes, chat games, exclusive codes and more every Friday! PLUS there’s loads of weekly promotions to make sure you’re always topped up with bonus for all your fave slots and bingo!